Last week, leader of the opposition and the Tamil National Alliance (TNA), R. Sampanthan, had two diplomatic meetings in Colombo with leaders of two Asian countries, who were on state visits to Sri Lanka, and a third with the Colombo based political section head of the European Union. What’s noteworthy about the high profile meetings was that he used it as a platform to impress upon the foreign leaders and official the urgency of expediting the constitution making process, saying his earnest desire was to have the process reach a decisive stage this year. Sampanthan, who met the two visiting leaders – Prime Minister of Singapore Lee Hsien Loong and President of Indonesia Joko Widodo – separately, told them his party was committed to finding a political solution within the framework of united, undivided and indivisible Sri Lanka. “Our willingness after a long armed struggle must be appreciated,” he said, underscoring the need to make maximum use of the opportunity to find a lasting solution to the national question. The President and the Prime Minister must convey the importance of adopting a new constitution to the people and convince them a new constitution is essential for all people in Sri Lanka, he impressed upon the two leaders. However, he also imparted that the new constitution should address the long standing legitimate political aspirations of the Tamil people who would not be satisfied with anything less than genuine power sharing arrangements where people would be able to exercise powers with regard to matters that affected them in daily life. He also maintained the new constitution must be enacted this year and emphasized that the issue could not remain unresolved. He also went on to explain the economic deprivations experienced by the people of North and the East in the post-war period and appealed to the two leaders to help uplift their living standards. Sampanthan had a similar message for Paul Godfrey, head of the political section of the European Union in Colombo, but with an added degree of urgency. He said wanted the government to submit a draft constitution to parliament immediately after the conclusion of the February 10 local government polls and that the proposed constitution should be placed before the people at a referendum. The Opposition Leader’s arguments during these meetings highlighted his commitment to finding a political solution to the national question through the speedy framing of a new constitution. This urgency was also reflected in his Thaipongal message, where he called for a new constitution without delay in the New Year. In that message, Sampanthan appreciated the meaningful steps taken last year that saw an interim report being submitted by the steering committee of the Constitutional Assembly. Sampanthan’s position is unenviable, given that post-war realpolitik compelled him to cooperate with the current government in the constitution drafting process, even in the midst of highly pessimistic campaign by hardline political forces from among the Tamil polity. And the history of Tamils being betrayed by successive Colombo governments, especially in finding a political solution to their problem only adds to the difficulties. 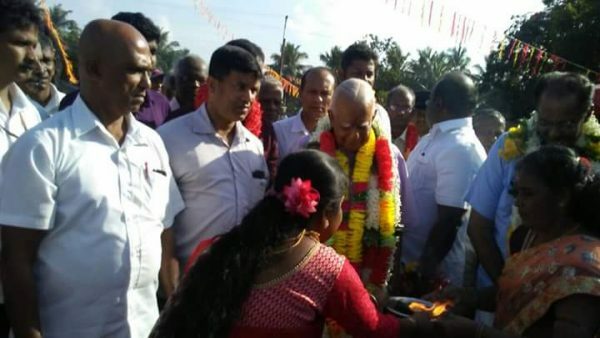 Sampanthan is in a delicate position where he can neither afford to completely give up hope on the current initiatives nor ask the Tamil people to trust them fully. In a recent interview with the Colombo correspondent of The Hindu, he said in the present circumstances all his party could do was remain steadfast in the pursuit of the process towards an early and successful conclusion and that they couldn’t despair or abandon things. Sampanthan’s commitment is admirable, but the pertinent question that arises is, will there be a conducive political climate after the local government polls in the South to continue the constitutional reform process? One needs not to be a political pundit to say that the continuation of cohabitation between the United National Party (INP) and the Sri Lanka Freedom Party (SLFP) is vital to the positive outcome of the process. Prime Minister Ranil Wickemesinghe is on record saying the government would decide on its course of action with regard to the constitutional reforms after the local government elections and that they would be making an effort to reduce the gaps between various proposals put forward by different groups. However, in the context of an acrimonious election campaign being conducted by the UNP and the SLFP and the vituperative allegations traded by their politicians, risking even the residual understanding, how can one hope that both sides would be able to continue to be main partners of the National Unity Government and engage themselves in a politically sensitive issue like constitutional making in a tangible way after the elections. The leaders who had earlier been talking of continuing the partnership between the two main parties in governance beyond 2020 and even till 2025, are now taking of forming a government of their own parties. Recently, in a hard hitting speech at a rally in Kandy, President Sirisena directly appealed to Wickremesinghe and members of all parties to cooperate with him in his crusade for clean politics and to bring alleged racketeers to justice. In a speech at an election rally in Ratnapura barely 24 hours later, he said he could form an SLFP government immediately if the 96 MPs of the United People’s Freedom Alliance (UPFA) stood with him. At another election meeting outside Colombo, he signalled the rift between the partners of the government on matters relating to the bond commission report, calling some politicians in the government and the opposition as VIP robbers and openly challenging them to hold the parliament debate on the bond commission and PRECIFAC reports before February 10. It is also worth noting that Sirisena dismissed the decision to have one-day debate on the reports on February 6, as a gimmick, saying it had been arranged in a hurried manner just to show the country, only because he made a challenge. It seems as though the President is trying to take a moral high ground on the corruption issue. With the main political parties intensifying their election campaigns, the fissures and insecurities between the partners of the government will continue to widen and be exposed the coming days, despite the confidence expressed by Wickremesinghe that the two major parties will continue their National Unity government after the local polls. The recent turmoil in the government however, proves it to be otherwise. As leading Civil Society activist and political analyst Jehan Perera pointed out in an article this week, President Sirisena’s recent criticism of his partner in the government coalition, the UNP, has sent the signals that the UNP -SLFP alliance may be ending sooner rather than later. Immediately after the general election of August, the two parties entered into a memorandum of understanding to be in partnership for a period of two years, which expired on September 2, 2017 and was extended till December 31. There have been talks about renewing the MoU after the local polls, but it seems the partnership may come to an end. It is in this precarious situation, where politicians of the two main parties are incessantly talking of partisanship instead of partnership that Sampanthan is praying for a speedier framing of new constitution that would ensure a meaningful lasting political solution to the long drawn vexed national problem.